The U.S. commercial space launch industry is at a critical juncture with increasing competition from abroad, AIA Vice President of Space Systems J.P. Stevens said. "As space launch capabilities have been developed by other nations, the U.S. share of commercial launches has decreased significantly," Stevens said before the House Transportation and Infrastructure Subcommittee on Aviation. 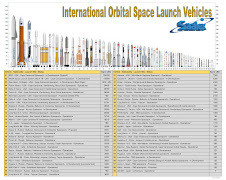 "In 2008 only six of the 28 worldwide commercial launches were conducted by U.S. companies." In his response to a question from Rep. Suzanne Kosmas (D-FL) during a Congressional hearing on human spaceflight safety, risk expert and NASA consultant to the Constellation Program Joe Fragola said that an article in the Orlando Sentinel Ares I’s first flights possibly being less safe than the space shuttle was incorrect and taken out of context. He said that the passage quoted by the Sentinel story from the Exploration Systems Architecture Study -- concluding that it would take at least seven flights (two test flights and five mission flights) before the Ares I and Orion crew capsule could to be deemed to be as safe as the shuttle -- referred to a more-powerful configuration of Ares-Orion that used a liquid oxygen-methane engine and not the simpler lower-performance configuration being designed today. Space solar power advocates may soon get their day in the sun, as different projects aimed at beaming energy to Earth from orbit begin to take shape. But at least one space power scientist worries that a U.S.-based project may be promising too much, too soon. Last week, California regulators proposed a plan to approve a 15-year contract with the American company Solaren Corp. to supply space-based solar power to utility giant Pacific Gas & Electric (PG&E) by 2016. The Japan Aerospace Exploration Agency (JAXA) has also teamed up with a private Japanese coalition to design a solar space station for launch by the 2030s. NASAWatch.com, a respected watchdog website, reported on Tuesday night that NASA allegedly withheld information from a White House panel that showed the Ares I rocket did not meet the agency's own safety goals. The information was contained in a chart prepared by Valador, a company that employs Joe Fragola, a consultant who has authored several studies for NASA. The chart clearly indicates that Ares I falls short of the safety standards that the Constellation Program set for itself.